The Surface Go is the thinnest and lightest Surface yet at just 8.3 mm, down from the 8.7 mm of the Surface 3, and 8.5 mm on the latest Surface Pro, but it undercuts the other models on weight significantly at 521 grams, or 1.15 lbs. That’s a full 31% lighter than the larger Surface Pro. The display is also smaller, this time coming in at 10-inches in the now familiar 3:2 aspect ratio Microsoft has focused on, and the taller aspect ratio certainly helps on mobile devices such as this that may be used in portrait. It’s an 1800x1200 PixelSense display, with 10-point multi-touch and Surface Pen support. The screen has a reasonable 216 pixels per inch of density, which is pretty much the same as the Surface 3 back in 2015 which was 213 PPI. That’s not quite as high as the Surface Pro or iPad Pro, but should still be fairly clear. One of the biggest upgrades over the outgoing Surface 3, which was the first of the value-oriented Surface models to ship with an x86 processor, is the move from the quad-core Atom to an Intel Pentium Gold 4415Y. This is a dual-core Kaby Lake processor with four threads, and a 1.6 GHz base frequency. With a TDP of just 6W, it’s not going to be a powerhouse, but it’ll still offer solid performance for a device of this size. The low TDP also means that it can be fanless, which it is. The CPU is coupled with the Intel HD Graphics 615, which offers 24 Execution Units (EUs), although at just 850 MHz maximum boost. Still, that should offer a good jump over the Atom in the previous model. The base model comes with just 4 GB of LPDDR3-1866, and 64 GB of eMMC storage, although it will be offered in 8 GB RAM versions with 128 GB and 256 GB NVMe SSDs, which should offer much better performance. 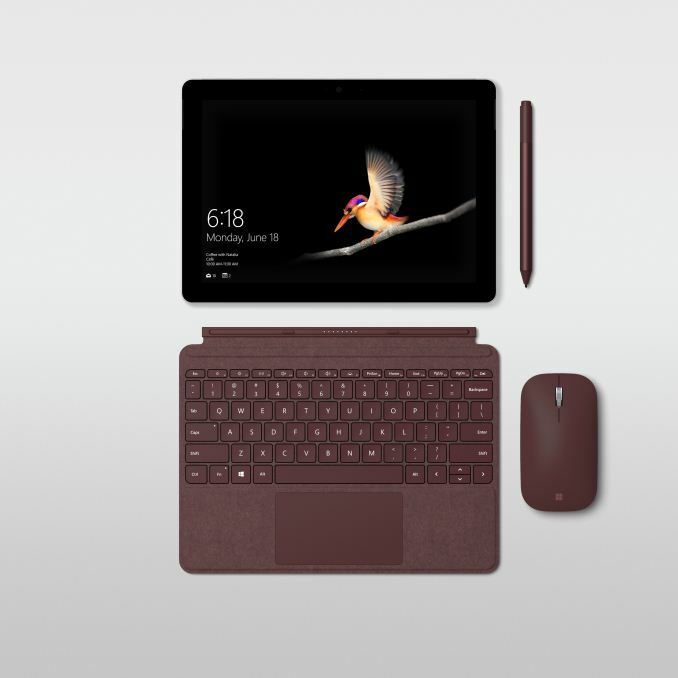 The Surface 3 was charged with micro USB, but the Surface Go steps up to the 24-Watt magnetic Surface Connect found on the rest of the mobile Surface lineup, and it also includes a USB 3.1 Gen 1 with a Type C connector, and they’ve kept the expandable storage with MicroSD included. Microsoft has also included an IR camera for Windows Hello login, along with a 5 MP front camera for 1080p video, and an 8 MP rear camera. For those that want to use it on the go (pun intended) there will be an LTE model available too, which makes sense with Microsoft’s push towards Always Connected PCs. Microsoft is claiming up to 9 hours of battery life which they tested doing video playback on the top end model. Microsoft is also launching a new Surface Type Cover for the smaller model, featuring the same Alcantara as its larger siblings, or as just black if you prefer that. 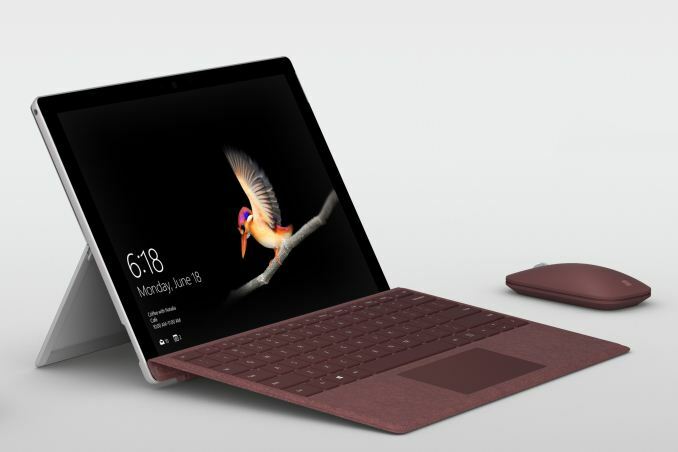 Microsoft has also found a way to fit their full-friction hinge to the smaller Surface Go, allowing for up to 165° of movement. 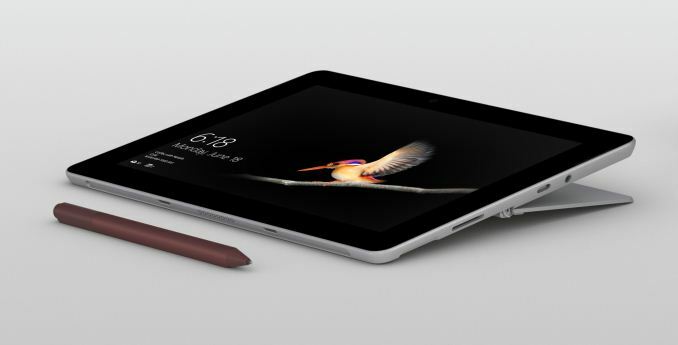 The new low-end Surface Go looks like a great replacement for the Surface 3, offering a way into the Surface lineup at a much more affordable price. The move to Kaby Lake will be a major boon to performance as well. Prices start at $399 for the base model, $449 for the same model with Windows 10 Pro, or $549 for 8 GB of RAM and 128 GB SSD. The 256 GB and LTE models will ship later. Pre-orders should be available soon. Pet peeve when I hear this. No computer, properly maintained, gets slower all the time. It’s metal and silicon- there is nothing “wearing out”. It’s just software “creep” slowly installing more and more things that want to have something running in the background. You have to be aggressive and defensive. Every software developer in the world for some reason has the arrogance to think you want their silly app that plays fart sounds running all the time with an icon in the Systray. Autoruns (a Microsoft tool) will list everything from every source. Being aggressive there will fix it 100% of the time. Keeping the file system clean will fix the rest of the times. Since you're wondering about whether to recommend Surface devices to your clients, I should probably also share the experience of other professional users around me. A few of my electrical/computer engineering professors who got the Surface Pro 3/4 said they've regretted it due to firmware bugs and Windows 10. The stylus could randomly stop being recognized requiring a reconnection of the battery (even with a new battery, a problem that I've shared), wake from sleep issues often require a restart when lectures were supposed to begin, etc. I know at least one professor who just lets his SP collect dust in his office after he has put real effort into using it, he has since gone back to using his previous Macbook and called the SP "an expensive paperweight". It's not only firmware issues that push them away of course, the whole ads everywhere on the OS nonsense is also irritating even though we all know how to turn them off. A couple of them said they will be getting Macbooks in the future. All these are coming from technologically competent professors, which really doesn't make a good case for recommending Surface devices. Now to answer what you've asked about my SP4, it's now my girlfriend's main computer. Some months ago she complained about sleep issues still, so I've disabled sleep and it now hibernates instead. She doesn't use the stylus so I don't know whether new updates have been doing it any justice. I haven't heard of other problems about the SP4 from her, but she really uses it more like a traditional desktop so this is probably not a very relevant point of reference. I've personally moved to Linux on all of my devices, initially due to my displease towards the aggressive Windows update policies, eventually due to finding Linux a superior environment for coding and graduate research. This so much. Microsoft's inability to recognize and fix issues ended up with them loosing just about all their Education, SMB, and Enterprise hardware business that they were setup to easily walk through the door on.